This is the starting page of a travel account of a 11-week, 5-country trip through parts of Latin (mostly Central) America from 21. March to 28. May 2001. The account contains day-to-day entries, high- and lowlights of the trip and pictures. To read through sequentially, simply click on the the "next-page" link at the bottom of each page. The idea of taking an extended leave period from work occurred to me as a flash from nowhere while walking back to my office from a rather gloomy meeting in Autumn 2000. I was lacking motivation and felt I needed a change of direction. I had been working for ten continuous years in the same company and I was entitled to take a sabbatical for a minimum of 8 weeks. Wouldn't this be a great opportunity to take an exciting break? My anniversary would be on the 1st of April 2001, so I would plan going around then. I'd been wanting to travel for a longer time period for quite a while - there seemed to be so many places interesting places in the world. I was a bit uncertain how I would handle a longer trip, though, since I had never been traveling for any longer period of time. Two regions in particular seemed interesting: South East Asia and Latin America. Latin America was my first preference, due to my affinity to Salsa music and dance. I was yearning to see how it felt to be near it's roots and to check out contemporary influences. As time went on, my picture of the trip was starting to change. Whereas I was focused on South America at first, I was now drifting towards Central America. Guatemala seemed fascinating: Volcanoes, deep blue lakes. Venezuela still had me hooked and it stayed. I had heard good stuff of Costa Rica, so that was on the list too. Panama? Just because of the Canal? Why not! Looking at the countries on a map made a trip between them geographically logical. I dropped all countries which assumed to be unstable: Colombia, Nicaragua, Honduras, Peru. Reading the warnings about the normal countries seemed bad enough, I wasn't willing to take any substantial safety risk on this journey. The logistics of booking such a trip was initially daunting to me, and it took quite some time for me to overcome my resistance of entering the unknown to begin the planning and booking process. An afternoon off from work sufficed to check out three well-known travel agencies for backpackers in Zurich. The first of them was SSR. I wasn't too convinced about them at first, but decided to give it a shot anyway. We had prepared a rough map of the countries we were wanting to visit together with an approximate schedule, and it turned out that we just walked into the SSR office, discussed the various transport possibilities and options, and then more or less finalized the whole journey right there and then! It was amazing! The details were as follows: Air France would allow an open-jaw ticket across the Atlantic, Zurich to Havana and back from Caracas to Zurich. Two weeks of stay in each country with the exception of Panama, where we one week would suffice. For flights between the countries, a "Saspo Pass" offered by a consortium of local carriers was available which connected most Latin American countries by air. It's cost was calculated by adding up each leg of the connecting flights which cost a specific number of points, resulting in reduced costs compared to using regular scheduled flights. The guy at the travel-office, Tom, seemed quite knowledgeable and reliable. The flights were not as expensive as I had imagined, and suddenly planning such a trip seemed so easy! The flights were booked (the dates could be tweaked during the journey if required) and the first hotel night in Havana (probably need a pre-booked room anyway in order to fulfil Cuban entry requirements). Other travel agents were checked out too, and though they were friendly and helpful there, they didn't seem very knowledgeable and the flights they offered were significantly more expensive. Booking a rental car in Cuba came as an afterthought after talking to people who'd been there. As were arrival-day hotel nights in Guatemala City and Caracas, where there'd be late arrivals in the evening or at night. For the travel agency, the whole booking process eventually was quite an undertaking, with us exchanging many telephone calls and emails to confirm and settle all details. One hotel and the Cuban rental car would not be definitely booked until the day of the journey, and those vouchers needed to be fetched directly at the airport. In the meantime, private Spanish classes made the most sense, as the teacher seemed convinced that "quite a lot" could be learned in the remaining two months. She was Chilean, friendly, motivated, encouraging and humorous. She was also punctual, methodical and talkative. Two classes a week of about 1.5 hours each. Traveling by backpack was a first for me, and I asked and looked around to see which model would best fit me. An afternoon of shopping got myself a 55 litre backpack with 15 l of unfoldable extra space. It was to be traveling really light, taking thin, light clothes (a bundle of T-shirts, two pants) to last for a week; a toilet bag, a pair of shoes along with lightweight sandals, a light fleece pullover and a cotton jacket, travel literature, a mosquito net and my video camera. The small-item list included a small flashlight, medicine-kit, Swiss army knife and a 110-Volt adapter. The vaccinations were done in a jiffy, although I delayed actually taking them. The Zurich Tropical Disease Institute has good counseling and will give you all the necessary shots right away. I required yellow fever and some emergency tablets against Malaria. I, oddly enough, didn't react much. In the past I'd always had strong reactions to vaccinations. International driving licenses turned out to be unnecessary (only driving in Cuba). 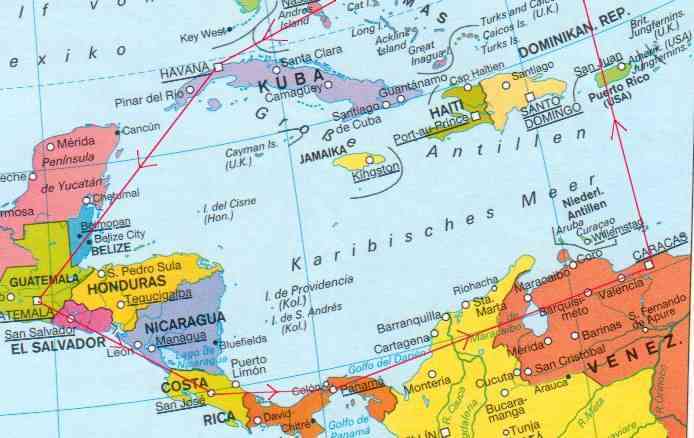 As travel guides Lonely Planet's (LP) Guides of Cuba, "Central America on a Shoestring" and "South America on a Shoestring" were used. Lonely Planet make good, practical and comprehensive guides, but they are so popular (LP is supposed to be the largest travel publisher in the world), that the "Lonely Planet Trails" are followed by too many people at a time. This has unavoidable negative consequences on the destinations: sights, hotels and restaurants, the people and prices: the recommendations are frequented by lots of like-minded Lonely Planet readers. Also took large maps of each country. A sudden problem were plans of the owner of my flat to renovate the building in which I lived. It would be substantial renovation, with major areas such as kitchen, bathroom and all exterior doors and windows being replaced. That would involve clearing most of the flat of personal belongings as the need arose. But since I would be away, this would be impossible! It occurred to me that Iris, who was overseas at the time, was going to be returning to Switzerland about the same time as the journey. She would be a good person to take care of everything and she would be needing a place to stay when she came back anyway. I contacted her and was glad she accepted and that this problem was taken care of too. I kept a travel diary during the trip. These web pages contain transcripts of it along with some of the pictures. Managing to lose my first diary in Guatemala, that portion of the trip is rebuilt from memory (up to 15.4.2001). No diary stuff, just the favourite pictures only, please!